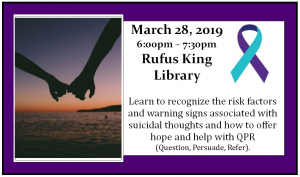 Rufus King PTSO and school counselors will be hosting a suicide prevention workshop. This workshop is for students, parents, friends, medical and mental heath professionals or anyone who wants to learn more about suicide prevention. Please join us on March 28th from 6:00-7:30pm. Light refreshments will be served.